The recent spate of communal violence in Bengal has thrown up two stunningly contradictory responses – one by a minister in the Narendra Modi government, the other by a local imam. While Union minister of state for heavy industries and public enterprises Babul Supriyo on Thursday threatened to “skin” some people shouting slogans against him, Maulana Imdadul Rashidi, imam of the Noorani Mosque in Asansol’s Chetladanga Nadi Par. the very same day, urged his congregation not to retaliate for his son’s death. Both the appeal for peace and exhortation to violence played out at Asansol, which along with other districts, recently saw bouts of communal violence over armed Ram Navami processions. Five persons have been killed in the violence. In contrast, Rashidi, who lost his 16-year-old son in the violence, spoke a language of peace and harmony. Sibtulla Rashidi, who sat for his Class X board exams this year, went missing after communal clashes broke out in the Rail Par area of Asansol on Tuesday His body was recovered late on Wednesday night and could only be identified yesterday. It is now suspected that Rashid was beaten to death by a mob. Hours after losing his son, the imam told a large congregation he was presiding over to refrain from violence. As thousands of people gathered at the Eidgah Maidan after Sibtulla was buried, Rashidi appealed for restraint and peace. The imam said that he would leave the town if there was any retaliatory action to avenge his son’s death. “I want peace. My boy has been taken away. I don’t want any more families to lose their loved ones. I don’t want any more houses to burn. I have already told the gathering that I will leave Asansol if there is any kind of retaliation. I told them that if you love me, you will not raise a finger,” said Rashidi. “I have been an Imam for the last 30 years. It is important that I give the right message to the people – a message of peace. I need to get over my personal loss. People of Asansol are not like this. This is a conspiracy,” he said. Supriyo, on the other hand, maintained that the state government had compelled him to use such vituperative language. “As the local MP, it is my responsibility to stand by the people who are in trouble, but the police, without any reason, stopped me from meeting them…. When people want to share their plight with me, how can you stop me? As a minister, if the police tells me not to enter an area where prohibitory orders are in force, I will not break the law. Law and order is a state subject. I respect that, but this is not acceptable,” he said. This is not the first time the BJP MP has acted in an inflammatory manner. Soon after the Ram Navami clashes broke out, Supriyo tweeted graphic details about the violence in Raniganj, in his constituency. According to a report in The Telegraph, “the tweets identified a section of the victims by their religion and clearly indicated the purported community to which the alleged perpetrators belonged.” The report said that within a few hours of the violence in Raniganj in Bardhaman, the minister uploaded a video clip and a graphic. Asansol mayor and Trinamul MLA Jitendra Kumar Tiwari appealed for peace and chief minister Mamata Banerjee asked police to take stern action. “A section of mischievous people are trying to foment trouble in Raniganj. I appeal to the people to stay calm and not to lend their ears to rumours,” Tiwari said. 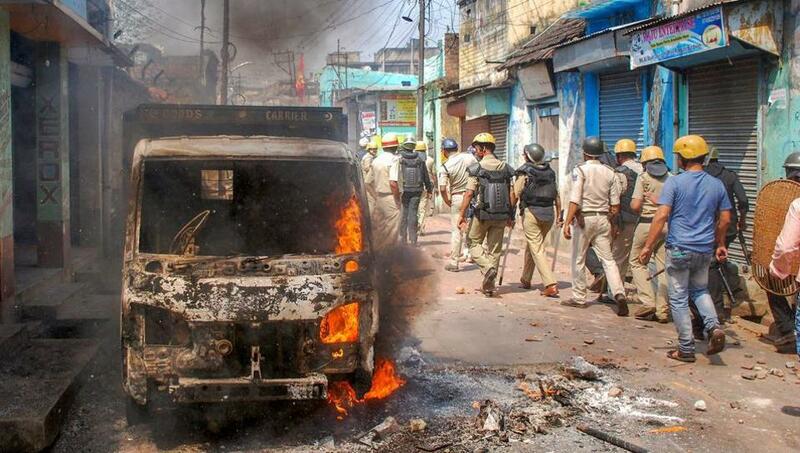 Following the violence prohibitory orders have been imposed in Asansol and internet services suspended. Meanwhile the central government has sought a report on the violence from the Trinamool Congress government in Bengal.